I like to put my handmade cleaning products into REUSABLE glass containers, to help ELIMINATE my use of plastics in my home. Make sure to clearly label all products. When I clean my home, I not only want it sparkling, I want it safe. Many conventional cleaning products we buy to clean our homes contain ingredients that are not safe for our families, pets or the environment. Luckily it is easy to make your own products that are non- toxic with affordable everyday ingredients. This guide can help you save money and have a safer greener home! Glycerine- This hydrophilic liquid is antiseptic and helps to moisturizer the skin. I love having it around the house to make soap or even herbal tinctures. It can be found in pharmacies or in a natural food store usually with essential oils or other carrier oils. I buy mine in bulk from Amazon. Hydrogen Peroxide- This is a great disinfectant- the household concentration which is usually 3% can be found in pharmacies. Liquid soap- You are looking for a products called Castile soap, a veg oil based product, my favorite being Dr.Bronners. White distilled vinegar- this simple ingredient in the cure all natural cleaner. It helps to remove grease, scum, minerals and can also act as a deodorizer. Washing soda- (sodium carbonate ) don't confuse this with sodium bicarbonate as this product is a bit more caustic and can remove wax from flooring (oh no!) , also not to be used on aluminum or fiberglass. Arm&Hammer make a product that can be easily found in the laundry section of the grocery store. 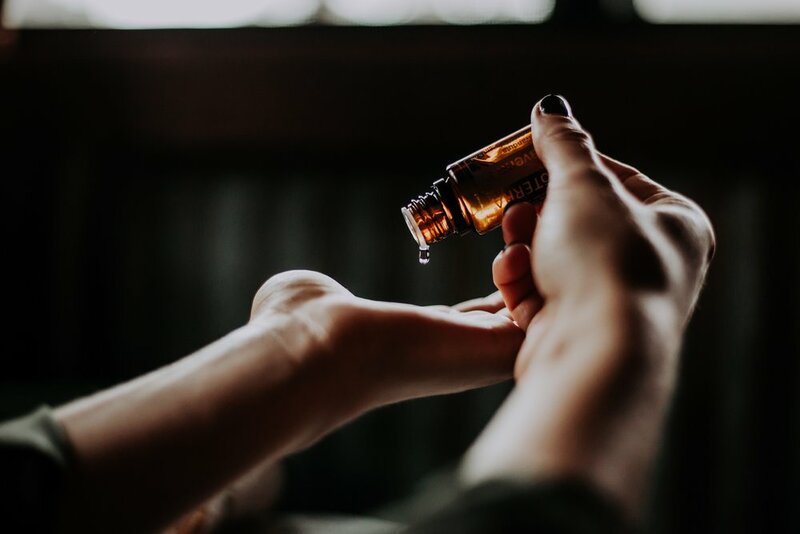 Essential oils (EO)- These are mainly used to create beautiful scented products but certain products can also help to distinct as well, such as tea tree oil. They are easy to find in natural health foods stores or online. All purpose cleaner- This product I always have on hand as it can be used for cleaning counters, highchairs, walls, floors, and even carpets. You can mix all ingredients straight into a spray bottle, I like to use glass ones, it is super simple and super effective! Glass cleaner- Combine 1 quart warm water with 1/4 cup white vinegar and 2 Tbsp. Lemon juice, shake to blend, you can mix all ingredients straight into a spray bottle. Add two drops of essentials oils for a nice scent. Hand cleaners- To remove heavy grime from hands combine 4 ounces of beach sand, 1 ounce of pumice powder with enough glycerine to moistine the dry ingredients. Mix all ingredients into a wide mouth screw top jar, you only need a small amount at a time, rub into hands thoroughly. Hand disinfectant- Add ten drops of tea tree oil into 4 ounces of Castile soap, shake to combine. Air Freshener- In a bottle combine 24 drops of EO (suggested scents- grapefruit, lavender, sweet orange, basil, lime ) with 1/2 tsp. vanilla extract, fill with about 2 fluid ounces of distilled water, Shake before each use and mist throughout your home or office. Laundry detergent- this is my all time favorite recipe, I got it from my mother and have been using it for years! It's so easy to make and is easy more affordable. MY husband has very sensitive skin so I am always looking for products that are super gentle yet effective to get out heavy stains and this is it! -Grate the soap and put in a large sauce pan. Add 5 cups of water and heat until the soap melts. Add the washing soap and borax and stir until dissolved. Remove from heat. Pour 4 cups hot water into a bucket. Now add your soap mixture and stir! Add 1 gallon plus 5 cups of water and stir. Let this mixture sit for 24 hours and it will form into a gel. Transfer into a cute sealed container. Sometimes this mixture needs to be shaken before use. Use about 1/2-1 cup per load. Fabric softener/ deodorizer- In a large bowl add 2 TBSP. baking soda, slowly add 1 tsp. of vinegar at a time and mix thoroughly until you have added 1/2 cup total. Allow the bubbling to cease completely before adding next teaspoon. Add 3/4 tsp of essential oils (suggested scents- lavender, sweet orange, neroli, cedar wood, bergamot) and stir until mixed. After bubbling has stopped pour into a glass container. To use this product, shake gently before uses and add 2 TBSP. for a small load, 1/4 cup for a medium and 1/2 cup for a large load directly into washing machine. Bleach Alternatives- You can of course use commerical non-chlorine bleach or try adding 1/2 cup 3% hydrogen peroxide in the rinse cycle, or 1/2 cup baking soda to warm/hot water wash cycles. Pro Tip- After your clothes have spun dry in the washer, hang them in the sun to dry, Sunshine is Natures’ natural bleach! Garbage/Diaper pail deodorizing pods- In a bowl combine 1/2 cup baking soda and 1/2 teaspoon essential oil blend (suggested Lime, grapefruit, lavender, sweet basil and orange), Mix this thoroughly to ensure the oils are evenly distributed thru the baking soda. Slowly add 1/8 cup distilled water, stirring continuously, until moist clumps form. Place 1-2 teaspoons of this mixture into ice cube or mini muffin trays. Allow them to dry for 1-2 days. After they are dry you can tape one pod to the inside of the lid of a garbage can or diaper pail. Moth repellents- My favorite thing to do for those pesky moths, especially when storing winter sweaters and clothing away, is to sew small pouches and fill with fresh cedar chips or dried lavender and pile in between the fabric. If you want to get fancy with your sachets you can combine 2 ounces of dried rosemary, 2 ounces of dried mint, 1 ounce dried thyme and ginseng, with about 8 ounces of whole cloves. Blend this mixture together to fill small fabric sachets and store with your woolens. Also remember to store clean woolens in a sealed plastic bag or in airtight containers. If you have found moths or larvae, you can place the item in the freezer for a couple of days until they die off. Toilet bowl cleaner- Mix all ingredients into a 16 oz. bottle, 14 fluid ounces of water, 1 1/2 fluid ounces of castile soap, 1/2 teaspoons of essential oil blend (suggested blend sweet orange, texas cedar wood, clove bud, pine, grapefruit, frankincense, coriander, tea tree). Pro Tip- Drain water from the toilet bowl for better cleaning, clean thoroughly and often. Rust remover- Rust stains can be removed from porcelain by scouring with cream of tarter. Tub and tile cleaner- Mix 1-2/3 cups baking soda with 1/2 cup of soap, add 1/2 cup of water and then 2 TBSP. vinegar. You can add a few drops of EO if you would like. Store this mixture in a squirt top bottle and shake before using. Rinse thoroughly to avoid leaving a residue. Natural Soft scrub- Combine 1/2 cup baking soda with just enough vegetable oil- based liquid soap to make a nice thick mixture, like cake frosting. Add about 15 drops of Tea Tree oil. Scoop the mixture onto a sponge and scrub sink, bathtub, shower, formica countertops. Rinse well. Plastic shower curtains- These are my arc nemesis- one day I will have one of those fancy showers with just a simple panel of glass but until then add 2 cups vinegar to laundry soap in washing machine. Add a few small towels in the washer with the shower curtain. Hang to dry. Bathroom deodorizer- Into a 1 pound box of baking soda, mix 20 drops of EO of your liking. Place open box under the sink or near toilet. Add more EO as needed over the course of three months. Replace baking soda box every three months. All purpose floor cleaner- In a bowl mix 2 TBSP. castile soap with 20 drops of EO of your liking. Pour this mixture into a bucket with warm water and stir until blended. Use this to clean hard surfaces and floor. Do a small test on an inconspicuous area before general use to make sure it does not react with any specific finishings. Wood floor cleaner- Unvarnished floors- Mix 1/4 cup liquid vegetable-oil based soap. 1/2 teaspoon glycerine, 1/4 cup white distilled vinegar with 2 gallons of warm water. For Varnished floors, or no-wax floors, use a damp mop using 1 part vinegar to 10 parts of water. Vinyl floor cleaner- Use a damp mop- mix 1 cup vinegar in 2 gallons of warm water. Urine remover- Mix equal parts distilled vinegar and water. Spray onto the stain. Let stand for 10 minutes before blotting the area with a sponge or paper towel. Carpet odor remover- In a bowl, mix 1 cup baking soda with 1 tsp essential oils of your liking. Add EO blend and stir until all climbs are dissolved, Store in an airtight container. To use this product, sprinkle evenly onto carpet and let sit for about 10 minutes before vacuuming. All purpose cleaner- See above in the general cleaning section. Drain cleaner- Pour 1/2 cup baking soda down the drain, followed by 1/2 cup vinegar. Then create pressure, immediately cover the drain and let it sit for about 15 minutes. Follow with 2 quarts of boiling water. This is a great mixture to use regularly to prevent clogged drains and smells. Cutting board cleaner- Rub a cut lemon onto the washed cutting board with s small bit of salt to eliminate odors. Leather cleaner- Mix 1/2 cup olive oil and 1/4 cup vineagr in a squirt bottle, make sure to shake before each application. Circular rub with a soft cloth into leather for cleaning and conditioning, DO NOT use on suede. Make sure to do a test on an inconspicuous spot first. Wood furniture polish- In a 2 ounce bottle combine the ingredients, 2 fluid ounces of jojoba oil, 12 drops of EO blend (suggested scents- orange, cedarwood, grapefruit, pine, clove, frankincense, lemon, coriander). Combine all ingredients and shake well. To use shake bottle and apply a small amount onto a soft cloth and lightly buff the wood furniture. Make sure to put all products into clearly marked containers. Even though these are non-toxic products, still keep out of reach of children. Squeegees are great tools to help clean windows! Do a small test on an inconspicuous area before general use to make sure these recipes do not react with any specific finishings.